Former NHL goaltender Clint Malarchuk has gone through both physical and mental trauma in his life and, after two brushes with death, he's sharing his story and advocating for better mental health support. 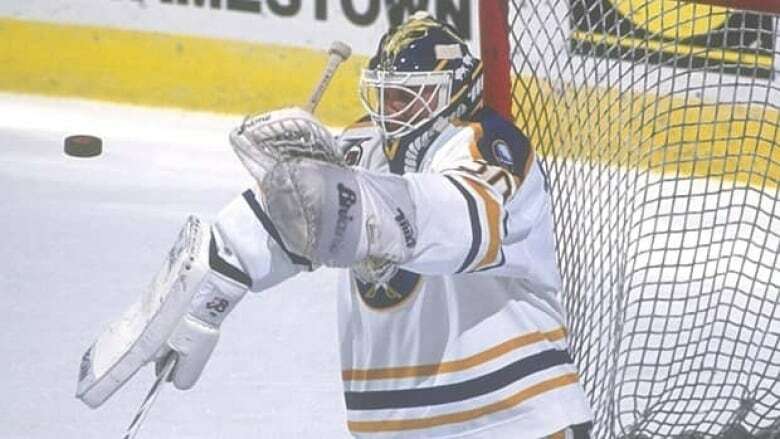 Malarchuk endured one of the most horrific injuries in NHL history in 1989 when he was playing goal for the Buffalo Sabres. The skate of an opposing player clipped his throat and severed his jugular vein. "That was the beginning of a real spiral downward because of trauma, which now they call PTSD," he told Gloria Macarenko, guest host of CBC's The Early Edition. "It really set me off in a lot of bad ways." Malarchuk was back on the ice 10 days after his injury and continued to be professionally involved in hockey for many years after. But he faced a long battle with obsessive compulsive disorder, depression, anxiety, panic attacks and nightmares, Malarchuk said. "I self-medicated with alcohol to try and calm my anxiety or pick me up when I was depressed," he said. "Addiction and mental illness, it almost goes hand in hand for so many of us." At his lowest, Malarchuk attempted suicide. "Being a suicide survivor, I'm a big advocate for helping people on addiction," he said. "There is no way I would have pulled that trigger had I been sober." He's taking part in an event this weekend in Surrey about the impact of addiction on families. "Addiction is so out there, we close our eyes to it a lot of times and it affects the whole family," he said. "They see it, they live it. How do you handle it?" Malarchuk's own story begins in a family where his father battled alcohol addiction, he said. Even long after the initial trauma, the effects linger and memories can be triggered, he said. "It still haunts me," Malarchuk said. Malarchuk said his mental health suffered a severe setback in 2008 when Florida Panthers player Richard Zednik suffered a similar injury to the one he had. Tragedies like last week's crash between the Humboldt Broncos team bus and a semi-trailer can also have an impact. "Anybody in Canada, or even North America, can really be thrown through a loop on that, but somebody like myself who has struggled with trauma, it affected me," he said. Malarchuk is speaking at the free event in Surrey, called How Addiction Affects Families, on Saturday, April 14. If you or someone you know needs help, contact The Crisis Intervention and Suicide Prevention Centre of B.C. by phone at 1-800-SUICIDE or online.